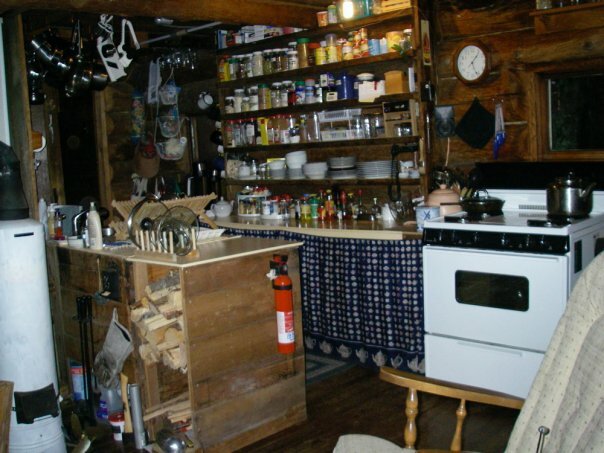 Recently, Michelle took photos around the first floor of the cabin to show the original owner/builders how things had changed lately. Here’s your chance to take a peek inside our home without making the hike across the bay. Imagine yourself standing in a fairly open room, pivoting around. That’s pretty much how Michelle took the photos, so it’ll give you a better idea of the space. 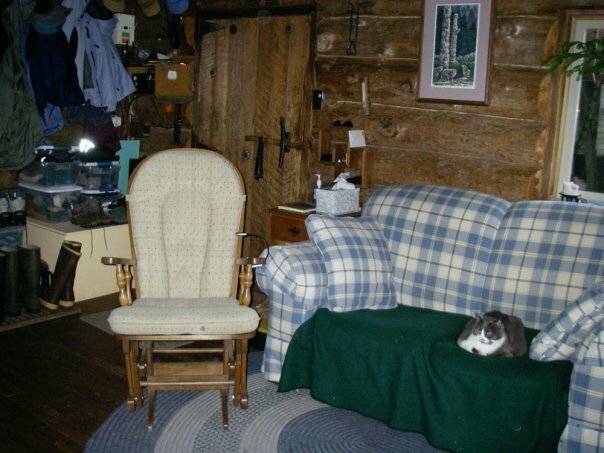 The entryway, with Michelle's glider, and Lissa on the loveseat. The beige box behind the glider is the battery bank. The totes hold our gloves, hats, and other winter accessories. Look! It's your humble host! Blogging, no doubt. Wish he'd get a REAL job . . . .
We laid the wood stove hearth ourselves from beach stone. To the right of it, just out of view, is the wood hot water heater, and behind it the shower, which more or less dominates the back center of the room. 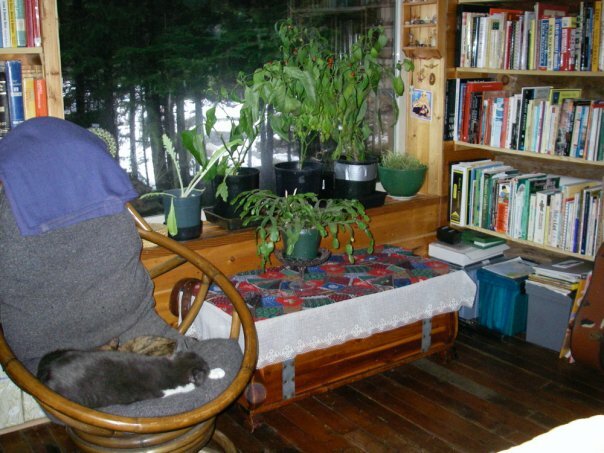 The "library corner," with our year 'round pepper plants in the window. The piano! That’s an interesting story, for another time, perhaps. It was here when we arrived. 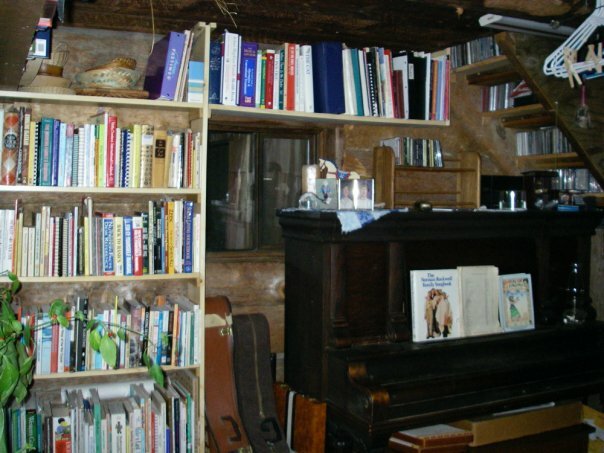 Note the CD shelves we built under the stairway. Space is a premium! The kitchen. The hot water heater is the cylinder on the left. You can see some of my icon collection on the wall. 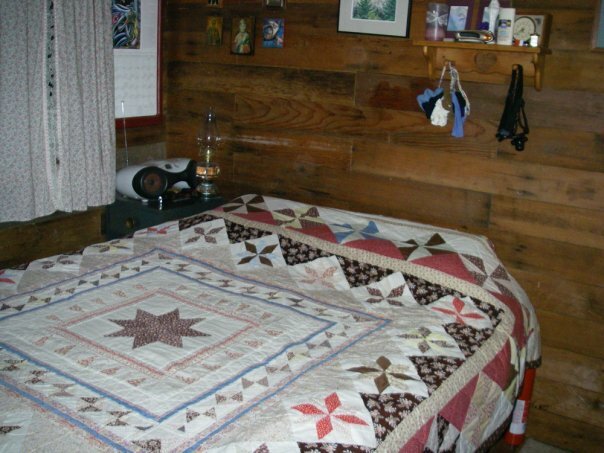 The queen size bed, which we built ourselves, takes up almost all the floor space, with a narrow walkway around it. There you have it! Michelle wanted to take some photos of the upstairs, but it’s hard to get a good perspective on the small space. Perhaps in the future we’ll get some good pictures up there. Michelle, there might be a possibility that I can pass on to you. Please watch for an email from us at our “geemail” account. Love the pictures! I am so happy to have found your blog. Thank you for sharing a portion of your life with us! Hi Keni! This is exciting–I’ll email you soon with my information. 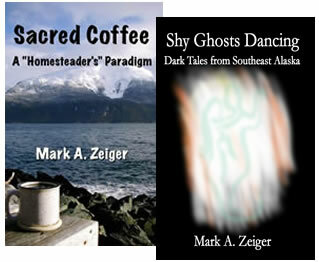 Hi Mark.I had e-mailed you awhile back.I met Dave and Anka in Baranov warm springs 2 winters ago with Andy Stoner from Sitka.Saw your blog and thought I,d say hello..Hello and have a fantastic day!!!! I commend you for your humility, honesty, and boldness. It is never easy to recognize, let alone publicly acknowledge, one’s limitations. Therein lies both strength and grace. I came back to the US 18 months ago after spending eight years in Afghanistan. I bought a small cabin on 7 acres just outside of town in western Oregon. 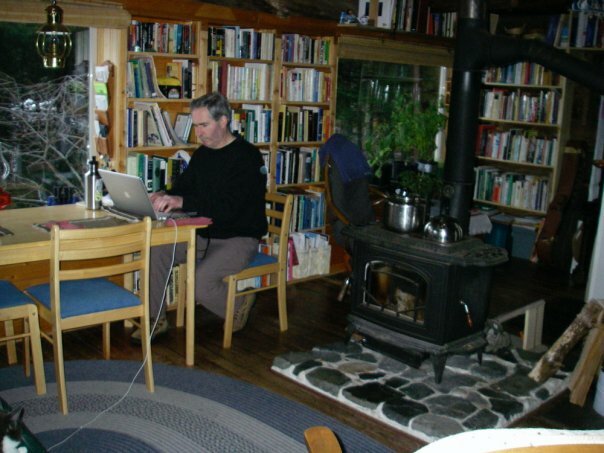 I am fortunate to have full utilities, but my acreage is heavily timbered and I rely on my wood stove for heat. Learning how to be an amateur lumberjack, manage my timber, and supply my own wood has itself been quite a learning curve as a girl who grew up in Chicago suburb! Kudos to you all! Alyce, sounds like a nice place! Oregon’s lovely, isn’t it? Michelle and I met at college (Linfield, in McMinnville) and lived in the Portland area for a while afterward. We still go back when we can. 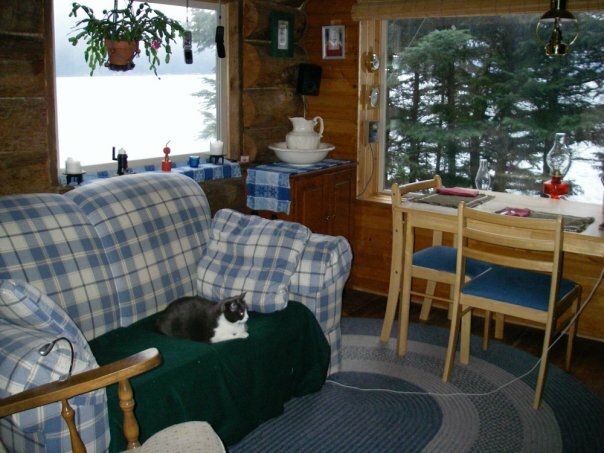 It’s great to look at your homestead photos on occasion and imagine myself in that setting once I retire from Anchorage. Mark, I left Facebook due to the insanity that it seems to have on it. Keep my email address and if I’m ever in SE, maybe I’ll find a boat and come visit! Good seeing you doing well friend. Hi Brian, I wondered why I hadn’t seen anything lately. I can’t blame you for bailing on Facebook–must be nice to have that chunk of free time back each day. You and your family should come and try out the lifestyle sometime. Remember, you can drive to Haines from Anchorage!